Applications: Trizact™ powerfile belts are ideal for finer work, particularly where a good finish is required on decorative materials such as stainless steel. Product Notes: Trizact™ grades are different to coated abrasive grades. Click the More Information tab to obtain a comparison of grades. Trizact is a synthetic abrasive and has the benefit of faster performance than with most costed abrasives. This means that a finer grade can be selected than might normally be used, resulting in fewer stages of work to achieve a fine finish. It also gives a more consistent finish through the life of the belt. This listing only gives exaamples of typical sizes and grades. Other grades and types of powerfile belt are available, please follow this link to see the available options. 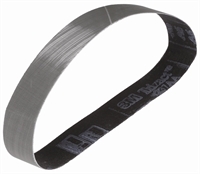 For coarse grinding, we stock a large selection of ceramic abrasive powerfile belts.